For WSPR based on an Arduino Nano please visit my Arduino page. 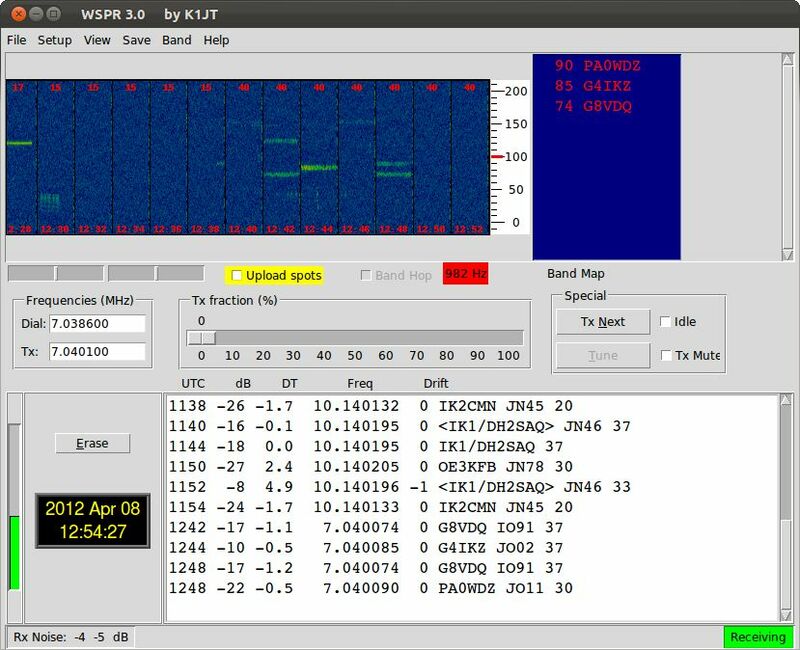 After reading some interesting stories about WSPR I decided to install the WSPR software on my computer and try to receive the WSPR signals. 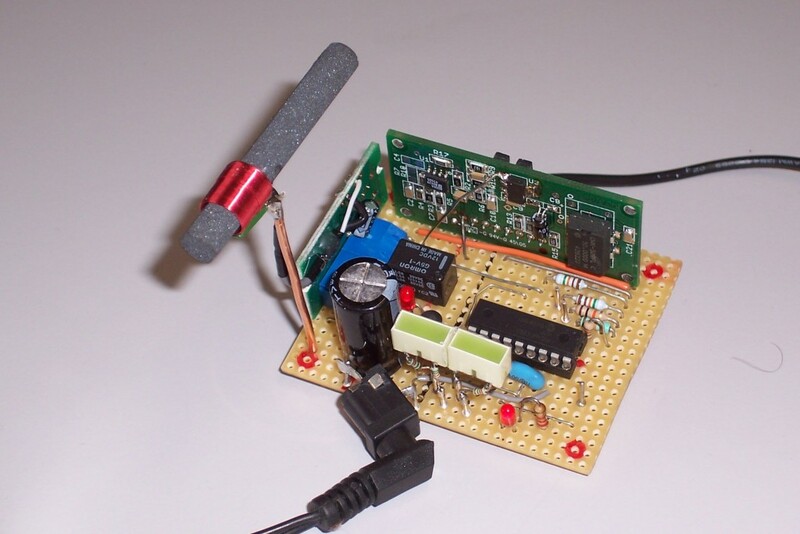 WSPR (pronounced “whisper”) stands for “Weak Signal Propagation Reporter”. It is a computer program used for weak-signal radio communication between amateur radio operators. The program was initially written by Joe Taylor, K1JT. The program is designed for sending and receiving low-power transmissions to test propagation paths from LF to UHF bands. WSPR implements a protocol designed for probing potential propagation paths with low-power transmissions. Normal transmissions carry a station’s call sign, Maidenhead grid locator, and transmitter power in dBm. The program can decode signals with S/N as low as -28 dB in a 2500 Hz bandwidth. Stations with internet access can automatically upload their reception reports to a central database called WSPRnet, which includes a mapping facility. – Be patience! You have to wait until the even minute starts and then wait for 2 minutes for a complete transmission, before you know that all your settings are OK…. You see stations received in the 30 and 40 meter band. 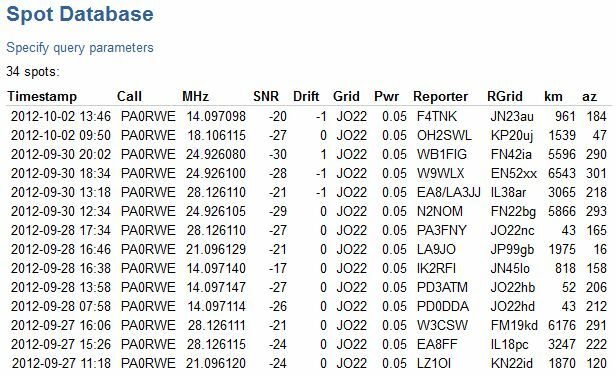 I used a simple loop antenna in my shack for receiving this WSPR stations. 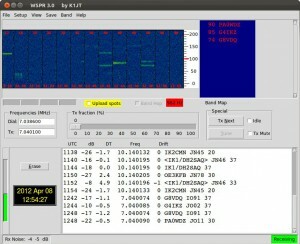 It is also very interesting to transmit WSPR signals and see the distance you have been heard. I searched the internet for WSPR transmitters and found an interesting site where you can find schematics for a stand-alone WSPR transmitter based on a PIC for control and the DDS60 (from the American QRP Club) as low-power transmitter. I build the Multi-band DDS WSPR Signal Source transmitter and added a DCF77 receiver to it to determine the exact 2-minute starting moment. This unit transmits in steps from 160 until 6 meters. Below you see the transmitter as it is running for some month. On the left you see the DCF77 receiver (Conrad) and at the top of the board you see the DDS60 VFO, used as a 50 mW transmitter. The PIC used is a 16F628. I modified the software for my own purposes. The transmitter is heard all over Europe but also in America! I’m using a 14 MHz dipole under the roof of my house. Below you see a part of the Spot Database.